Are we remembering our history and are we involving our next generations in the preservation and documentation of that history? This is a question that has been on my mind for a good while now. I have always had a love for history but it was not brought to the forefront until I was about 22 years old. I was going thru a rough part of my life dealing with a loss and I needed a hobby which would take my mind off of my grief. I was lucky enough to have a family friend who took me to a college library and started me in finding my family in census records. From then on, I was hooked on history and wanted to know more about my ancestors and about history makers. Does that still happen today? I don't know if people still mentor--they should. I see so many of the younger generation turning to other outlets sometimes ones which are self-destructive. Electronic media is used for everything. I'm not saying it is bad--it's not. It makes research so much easier than it has been in years but in some ways it makes our research lazy if we are not careful. Sometimes the only way you can find a record is in "Boots on the ground" mode. Everything is not online. Print out those family pictures you have on that SD card. Have something you can pass on to your cousins and descendants. Write letters. Go to your local library and look through their historical collection. The majority of those are books not available in digital copies and are non-circulating. I have always said, "I've never had to wait for a book to charge." Find a happy balance between old and new. Support your local historical society. If there is one in your area, you are lucky. So many are inactive in the areas where my family lived. I think in some ways the generation gap and the Internet played a part. You could get a great deal of things on-line and the members of the historical societies for whatever reason, just let the societies die out rather than make an online presence. If you are a member of a historical society I challenge you to find a way to get the younger generations in your area involved. Start your own blog about history, whether it is your family history, memories, traditions or local history you find fascinating. It can be any kind--Local Sports history, old buildings, church histories. There is a need for blogs about family history as was brought to my attention recently. Lend a hand. There are many indexing projects out there preserving and making available historical documents. The first one that comes to mind is FamilySearch.org but there are many more out there. Google search for a type that would interest you. Teach or learn a trade so that it isn't forgotten to time. Cooking, gardening, building, fishing--teach so it lives on; learn so it lives on. When you are older, those smells of food cooking, scent of flowers, sounds of nature will be ones that stick with you. Many families don't sit around the supper table and talk anymore. So much of oral history isn't passed on. Don't forget the art of conversation. Talk to your elders but more importantly, listen to them. I was extremely happy to get 14 new 4th cousins or closer matches on my AncestryDNA results overnight. I wish people understood the importance of uploading to GEDmatch. Too many treat the circles or the DNA Hints as facts. To them it is unnecessary to upload their raw data atDNA results to GEDmatch because Ancestry has told them the connection. Sure, if you don't want to prove your research, go ahead and believe that! Ancestry gives you hints and clues, It is on you to investigate and research those. I have the perfect example among my matches. This match is kin to me on my Mom's side thru the Luna line at my 4th Great Grandparents. She is not DNA kin to me or my Mother but she shows as DNA kin to my daughter and the Shared Ancestor Hint is my 4th Great Grandparents(my daughter's 5th Great Grandparents) Clicking on the "i" shows that my daughter and this match have a shared estimated atDNA of 6.6 centiMorgans(cMs) shared across 1 DNA segment. Ancestry has done a better job on their wording on the Shared Ancestor Hints than they did when they first appeared. [If you want to learn more about hints & shared records watch Ancestry's Crista Cowan and her presentation, "Don't be a Searcher, be a Researcher" from RootsTech 2017. What we should hear "You have a 6th cousin through the Luna line of your maternal Grandmother with whom you share a 6.6 cM portion of DNA across 1 segment. It is possible that it may be through that Luna line. You need to investigate further"
Instead many people feel that they don't need to investigate further and take that info at face value whether it is through lack of understanding, laziness or just not really carrying to know the truth. I'm not talking about those that just tested to learn ethnicity and don't care to do more. I am fine with that. Thankfully this match agreed to upload to GEDmatch. Since both of my daughter's Paternal Grandparents have tested I was able to tell that the connection was through my daughter's Paternal Grandmother's lines. I was also able to take it back a step further in finding where to look as my daughter's PGM's Mother(my daughter's Great Grandmother) had also tested. I should also mention that while my Daughter tested at AncestryDNA, her PGM tested at 23&me and her Great Grandmother tested at FTDNA. We can compare all of these test at GEDmatch. I did run the One to One for this match against my results and my Moms and she didn't have any measurable DNA match with us. I had a large 54 centiMorgans DNA segment(or chunk) in Mom's matches that showed up just under a week ago. Upon examining others who matched Mom and each other along the same segment I was able to determine it was likely from the Luna/Looney lines. All those that matched Mom along that segment have Robert Looney and Elizabeth Llewellyn as their most recent common ancestors. This is my Mom's 5th Gr Grandparents and back a good ways. That put Mom matching 6th cousins and several 6th cousins once removed at an amount (54cMs) that typically is indicative of 3rd cousins. I am thinking that this has something to do with this couple being from the Isle of Man or colonial. Last night I found that I had a new match that AncestryDNA estimated matched me at 50 cMs shared on one segment. The match is going to be on my Paternal side as he didn't match my Mom's test. Upon checking this match with my sister's test I found that he matched her even better. I think they probably share the same 50 cMs segment but they also share 4 other segments which I didn't get and match at 101 cMs over 5 segments. It is entirely possible that they share 5 different segments which doesn't include the 50 cM segment that he and I share. Shared matches appear to be somewhere along our PGM's Jakes/Morrow/Harger/Frizzell lines--all colonial. I can't wait to hear back from this match and hope to get them to upload to GEDmatch so I can identify the segments in my sister's file and make note that I got segments from our PGF along the 4 which I don't have in common with my sister. Looking through the ProQuest Historical Newspaper in search of some information on a Paternal great-uncle and had the urge to search for my 3rd Great Grandfather, Andrew Jackson McElroy(from my Maternal lines). I didn't have a source document for his death date. I knew it was some time after the Ogle Co.'s Compendium of Biography which was published in 1898. I also knew that he had written his will November 20th of 1896 and that the will was proved September 3rd of 1900 and recorded the next day in Van Buren Co TN Records. The first item that came up in my query led me to the answer. SPARTA, Tenn., Aug 21- Andrew Jackson McElroy, one of the oldest and best known men of this section, died Sunday night at his home at Bone Cave in Van Buren County after confinement to his room for some time. Col. McElroy was 86 years of age and until the past two or three years had regularly attended the courts here, where he enjoyed a fair practice. He had ever taken a great interest in politics and was an ardent Democrat. Besides holding several minor offices he represented this district in the State Senate from 1885-1887. His character was spotless and he was admired by all who knew him. The interment took place last evening at the family burying ground before a large attendance of relatives and friends. I did a Google search and found a site that lets you check a date to see what day of the week it was on for a given year. August 21, 1900 was a Tuesday which puts him dying on Sunday August 19, 1900. Problem solved! Andrew Jackson McElroy was likely born in April of 1820 as that is the age which he lists the most consistently in census records. For the 1870 Census he is listed as a few years younger. I just feel fortunate that he was listed at all. Several of my other folks aren't listed in 1870. The 1870 census is the first census after reconstruction and is notorious for inaccurate information some of which is possibly due to census takers from the north being using in many areas of the south. See the Census Book for more information on this and other census records. Below are a few of Andrew J. McElroy's Census entries. It is a rather large listing(516 pages) and is just one of the many items available to search within this collection. Check with your library and see if they have ProQuest available. Also remember that your public library isn't the only library available though it is one you should fully support. Colleges and Universities often times have great Family History Collections. I keep a template of this sheet and just make a copy when I need one to work with for another researcher. You can adapt this to fit your needs but this is what works for me and seems to be the easiest to understand. 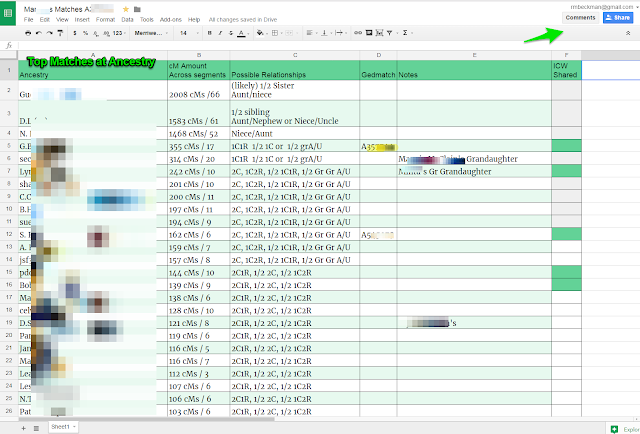 If you are working on your own matches you can start making the sheet...if not you will need to get the person to send you a share link to the DNA account with which you will be working. If they don't know how to do that I have a blog post that I wrote about Sending a Share link to AncestryDNA test results. Feel free to share that link with them if they need instructions on how to do that. Also if they aren't at GEDmatch you might also want to refer them to the Upload to GEDmatch post. There are many charts but I consult the ones at the shared cM project page. 4th Column = GEDmatch numbers--helps you to see who is already at GEDmatch and who it would benefit you the most to ask if they will consider uploading. 5th Column = Notes section--I put common surnames and notes on any patterns I see emerging in this section. 6th Column = ICW/Shared --you can use this section to color code groupings with the fill color feature if you want. If you know the grandparent you could put PGF MGM etc. here. You may not need this if you choose to color the entire rows for the groups. I just have an alternating color applied here so I can read across the row without losing my place. But coloring the entire row will work if you can to use a different color for each group of shared or ICW matches. Once your spreadsheet is formatted to your liking, visit the DNA Insight page of the test you will be working with and click on See All Matches From the main match consult each match's page and click on the "i" to collect the amount of shared cMs for each matches you want to catalog. Typically I only do this with an adoptee's matches that are 50+ cMs. Also look at the shared matches and start filling in info if you notice any patterns of surnames. Go ahead do this now while you are at their page. 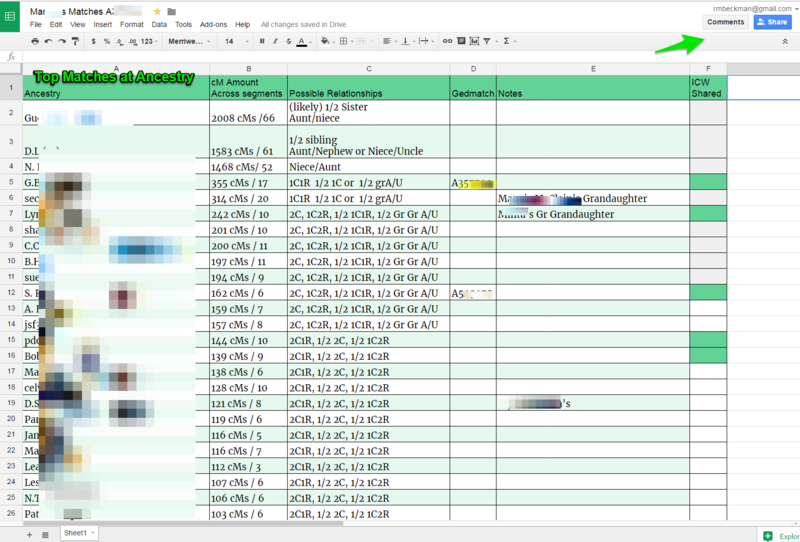 Once you have the spreadsheet set up click on the SHARE button in the upper right and enter the email(s) of anyone who is going to be helping or observing and set their permissions. They may view, comment or edit. If you find this helpful, please share. Also if you have ideas or comments I'd love to hear those as well. When I worked in Retail, February was our Inventory time so it felt like a good time to take inventory of my Ancestry DNA Circles. The next largest is that of Jabel Putman with 62 Members. My sister(full sibling) has 58 Circles She loses two of the Non-Directs but gains 3 Non-Directs. Felix Grundy Crick, Susan Frances Putman and Wade Henry Carlton. These are from our Paternal Grandfather's side who is a descendant of Cook, King, Putman, Manire, Harris, Ogilvie, Jackson. She has all 52 of my Circles. I have done a good bit of research on her Paternal lines and she would probably have more circles but the majority of those families had less children than most of mine did which may account for the lower amount of circles--less descendants available to test. The Hogland and Demonia lines are the exception. Also while all three of the Non-Directs she has are from my lines she has only one of them in common with me(the Acuff cousin) The other are the Hitchcock/Fleming ones that my Mom has from the Double cousins. I should also note that my daughter, my Mom and my sister all have New Ancestry Discoveries. I have none at this time. I have had several appear in the past but they didn't stay long. To me this reinforces the importance of working your circles and asking if the members will upload to GEDmatch.